We review a lot of affordable PCs and laptops, for many people, will seem like more than enough to spend. However, you get what you pay for, and a PC with components capable of playing the latest games and performing your everyday Windows chores at lightning speed doesn’t come cheap. If you’re going to spend a fortune on a PC, it might as well look the part and the Nebula is certainly dripping with bling. It comes in a gigantic Kolink Observatory case with a glossy, semi-transparent side panel and see-through front. Behind the front panel you’ll find three fans, with another one working at the back. 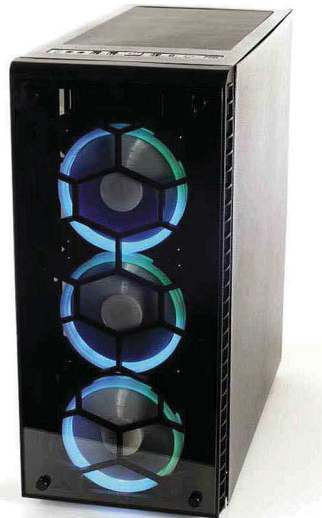 Each fan has 16 LEDs with a choice of over 300 lighting effects. On our test model, Palicomp had pre-configured a rotating, colour-changing light show, which is great for showing off when the lights are low but will probably need to be toned down when you’re sharing a room with it. Behind the impressive but arguably frivolous firework display, this PC has plenty of substance, starting with the Intel Core i7-8700K processor, which usually runs between 3.7 and 4.7GHz but which Palicomp has overclocked to 4.8GHz to make it perform even faster. Then there’s the Palit GTX 1080 graphics card, with its own 8GB of memory, also overclocked to match the processor, and – as if this weren’t speed-crazed enough – Palicomp has also fitted two 256GB Samsung PM981 M.2 SSDs, configured as a RAID 0 array to maximise space and performance (RAID 0 uses the drives independently rather than having one backing up the other). Running the AS-SSD benchmark (bit.ly/ssd452) saw sequential read speeds in excess of 3,250MB/s and write speeds of over 2,800MB/s. That’s ludicrously fast. Palicomp also supplies 16GB of DDR4 memory. excellent platform for all these components and controls the PC’s ID-Cooling FrostFlow water-cooling system. This, coupled with the whopping 240mm radiator, ensured that we rarely saw the processor’s temperature creep above 60°C, even during our punishing benchmark testing. The case itself is spacious, with plenty of room to work inside, which should make future upgrades a breeze. There’s space for another two DDR4 DIMMs, plus three PCIe 3.0 expansion slots, though one of the larger slots is partially obscured by the double-height graphics card. Down at the bottom of the case, there’s a spare 3.5in drive bay, just below the space where the 2TB Seagate Barracuda hard drive sits, which you can use for all the everyday files you don’t want to keep on the SSDs. The CCL is a subtier-looking alternative, with a cool white case that will still turn heads. It’s not as fast as the Palicomp, though. If you’ve got a 4K monitor to hook up to your new PC, this Scan model performed brilliantly at high resolutions. The CyberPower outperformed our top choice when running a couple of games benchmarks that the Palicomp found difficult to run while overclocked. already fast. 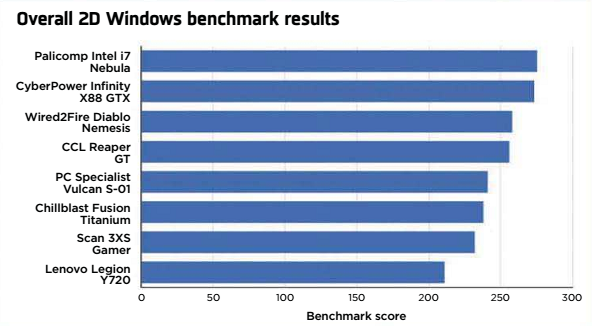 We compared it to seven other similarly priced PCs and the Palicomp was the fastest in our 2D benchmarks, with only the CyberPower providing any serious competition. This impressive performance also applied to games, with the Palicomp running 12 fps (frames per second) faster than the next fastest PC on Far Cry 5 at 1080p, and 2fps faster at 4K. It wasn’t all plain sailing, though. Running the Rise of the Tomb Raider and Metro: Last Light benchmark gaming tests at their highest resolutions required us to turn off this PC’s overclock in order to get the games running. This allowed the CyberPower PC, which was slightly less aggressively overclocked, to outperform the Palicomp, which might be worth thinking about if games are your main consideration. So has Palicomp over- egged its overclocking on this PC? Well, these issues only occured in these two benchmarks, and not in any other recent games we sampled. Given the extreme speeds on offer, even the Palicomp’s performance at its lower clock speed is fantastic in most games, so we’d suggest keeping the overclock for certain titles but stepping it back for others. It’s easy enough to do this from the motherboard’s settings. Awesome performance combines with a dazzling light show to create a killer PC. A machine this expensive isn’t going to be within everyone’s budget, but if you’re looking for maximum performance then the Nebula is tough to beat. 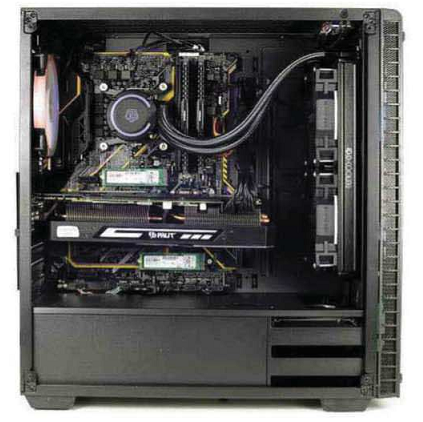 It’s big, brash and expensive, but it’s also an incredible PC.